. . . . . . . . . . . . . . . . . . . . . . . . . . . . . . . . . . . . . . . . . . . . . . . . . . . . . . . . . . . . . . . . . . . . . . . . . . . . . . . . . . . . . . . . . . . . .
Mute Song are proud to announce the premiere of Max Richter’s new ballet: Woolf Works, on the life and works of Virginia Woolf. 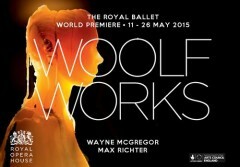 MAY 11-26th at the Royal Opera House in London.